After giving us three years of fun and joy and looking after her novice crew, Brigantia went to pastures new in the Autumn of 2013. This blog remains as an archive of our activities on board. ... ahem! Stop RIGHT there I think! Well there was some sun although nowhere near as much as we'd have liked. The sea was to be found in abundance. The sand turned out to be mostly mud. The rest I shall leave to your imagination. Right away we had problems with the engine which would persist throughout the year. That aside all went well that weekend and a fortnight later we reconvended on board for a long weekend of fitting out. That too went well and cuminated in Rik and I taking Brigantia for her first sail up and down the river. We were delighted to find that she sailed well and we even managed (by a fluke) to sail her back onto her mooring without starting the engine at all. Jane and I had a week aboard that May although variable winds and engine problems (again) meant we didn't get too ambitious. We did visit Brightlingsea, where the engine failed, and Bradwell, where the wind took control and blew us sideways into the pontoons! We had some issues with the genoa setup, later resolved, and spent a night at anchor in the Roach after being beaten up by the classic wind over tide chop in the Whitaker Channel. A great learning experience! The end of the month and into June saw persistent high winds and led to the cancellation of a planned weekend on board. There really was no point in travelling down as conditions on board would have been unpleasant to say the least. So it was mid-June before we headed down to Fambridge with Mark and Heather. We pottered downriver and pottered back again, nowt too ambitious. Back end of June I spend an unusual solo weekend on board, something I haven't done in the three years since at all. It was all about maintenance, I didn't actually go anywhere but I did dry her out on the slip, give the bottom a scrub (the cheap anti-foul was not working well) and manage to snag the topping lift with several boathooks tied together (it having come adrift on our first cruise in May). In no short order, Jane and I were down at the beginning of July for a long weekend on board. We'd hoped to get a bit further afield but gave up trying to get down the Whitaker in the teeth of the wind and spent the first night at anchor round in the Roach again. More engine problems on the Sunday curtailed the trip and we returned to Fambridge to spend Monday trying to fettle the damn thing. I stripped the fuel system down, dismantled the carb, cleaned everything out and it seemed to be running much better. We also sorted out a better spot on the tender dock with Toby after somebody nicked our existing hole whilst we were using the tender! August was a no-go month due to other demands on our time and then in September Rik and I attempted our first cruise as a crew. The weather was not kind at all and we spent five days stuck at Fambridge before finally getting underway on the Wednesday afternoon. A night at anchor in the Roach was followed by a mixed bag of sailing and motoring to end the day at anchor off Stone Point in the Walton Backwaters. With the forecast deteriorating for the weekend, it was unfortunately a case of heading straight back to the Crouch first thing the next morning. We lazed around on Saturday and went home on Sunday. Bit of a bust from the sailing point of view but we did get quite a lot of useful work done on the boat. We covered 86 miles (of the nautical variety) in 26 hours and 3 minutes at an average speed of 3.3 knots. We motored for 6 hours and 23 minutes. Back end of that same September and Glen and I were on board for a weekend. 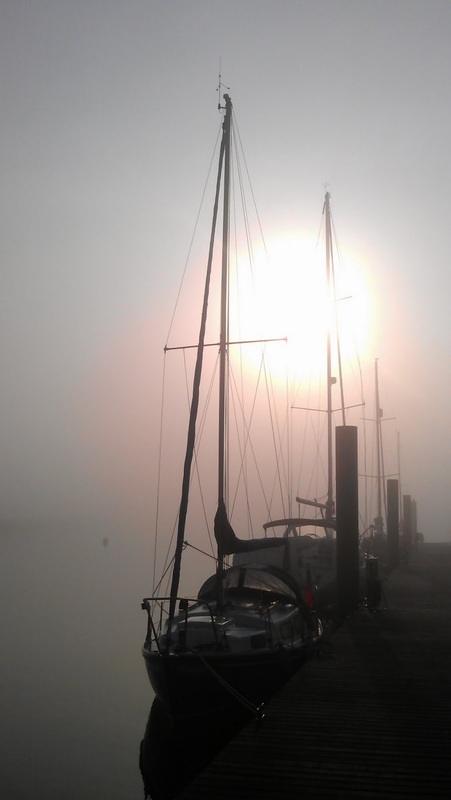 We travelled down on the Friday and then motored downriver on a very foggy Saturday morning. An excursion up the Roach beyond Paglesham culminated with a stunning night at anchor just downstream of the entrance to Paglesham Pool. Glorious starscape in the clear dark skies above complimented by the most astonishing display of phosporesence in the river! Sunday saw us heading back to base and then heading back home. We covered 22.3NM in 7:40 at an average of 2.9kts on Saturday although 5:41 of that was motoring uunfortunately. 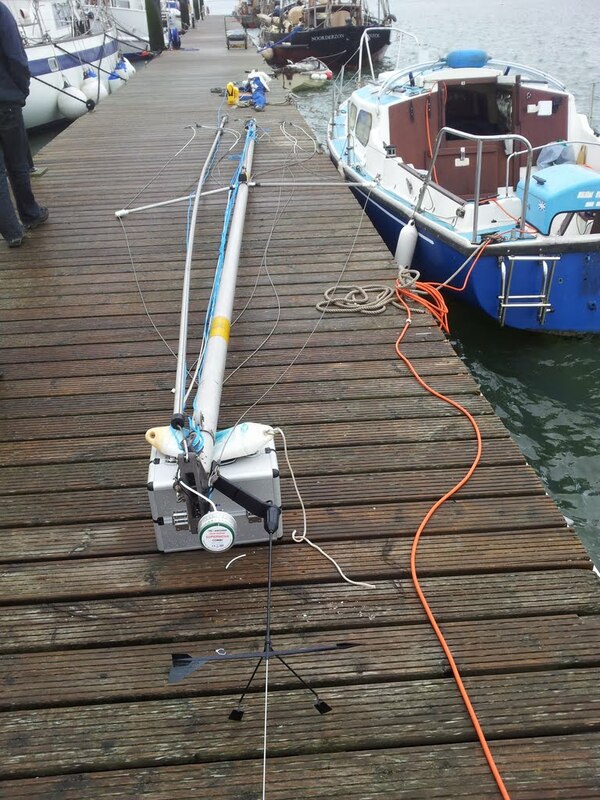 On Sunday we covered 10.53NM in 2:52 averaging 3.7kts all under motor. Jane hurt her back at work that autumn which effectively put paid to the season although we managed a static weekend on board in late October and I had an uncomfortable overnight trip on my own to measure up the outboard well in December. It had been a good albeit at times frustrating first year of our new adventures afloat. We'd been to Brightlingsea, Bradwell, Paglesham (although we didnt go ashore), the Walton Backwaters and made significant progress learning how to handle the boat. The weather though had been fairly rubbish all year, we'd coped but we hadn't had a single day of what you'd call nice weather. It had always been chilly, windy, damp or a combination thereof. 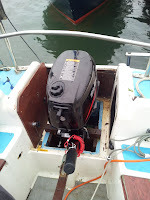 The year started with a big outlay - the purchase of a new 6hp 4 stroke Suzuki outboard. It definitely put a dent in the bank balance but we despertely needed a reliable, more economical and quieter engine. Well two out of three ain't bad since it turned out to be rather noiser than we'd hoped! The first weekend in March saw Rik and I on board on Thursday evening and off to pick up the new engine on Friday morning. By the afternoon it was in the hole although some work still needed doing to the mounts. Saturday, and with extra hands on deck in the shape of Glen and Mark, we dropped the mast, replaced all the blocks, rigging and the VHF ariel (running the cable down inside the mast instead of down the backstay as it had been) and made much progress on the engine well modifications. 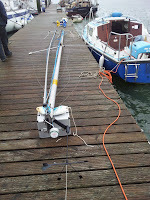 We got the mast back up in a hurry on the Sunday morning as the forecast for later in the day was not good! Glen and Mark departed after lunch whilst Rik and I had an uncomfortable night on board and an even less comfortable day on the Monday being bounced around all over the place in a howling gale. 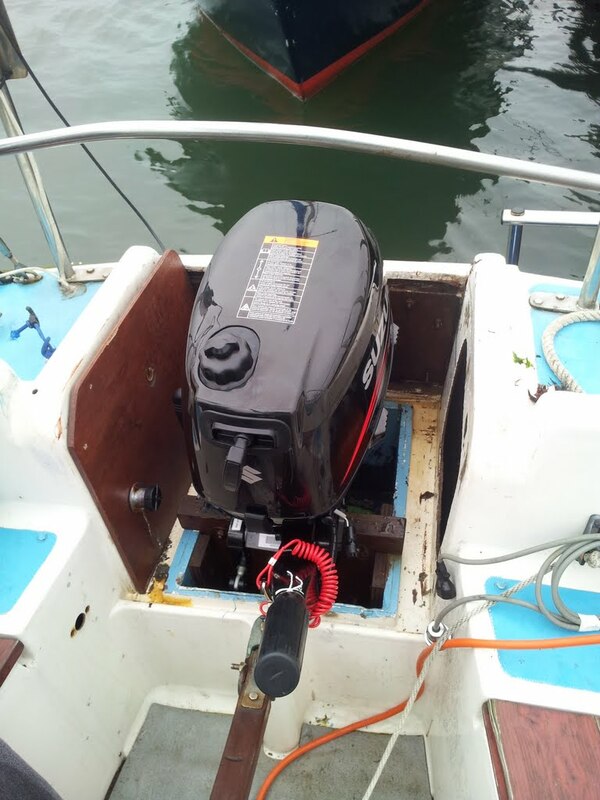 Tuesday saw Rik perform wonders of carpentry in the engine well to finish the installation despite the boat bouncing around like a very bouncy thing and then we went home! 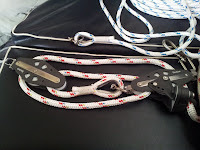 Glen and I headed down for the weekend mid-March with a box full of new string and spent the wekend replacing all of the running rigging. Mid-April and I was crew on Sabre, a Moody owned by Rog Smith, from Bradwell to Shotley arriving, excitingly, in the dark. 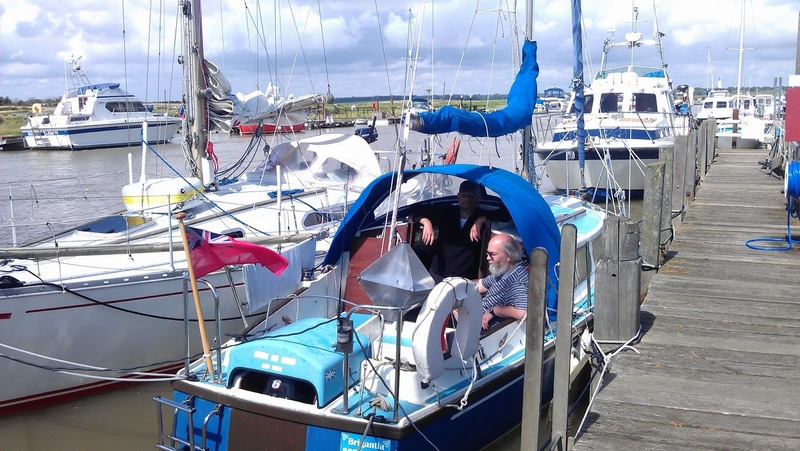 A social evening with the denizens of the East Coast Forum ensued followed by the return trip to Bradwell on the Sunday. The old engine was sold on via the YBW For Sale forum and then the weather got in the way again. 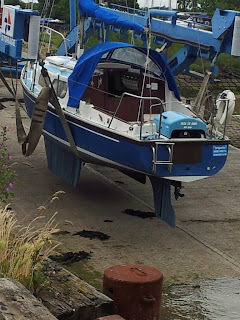 Plans to dry out on the slip to scrub and anti-foul were scuppered by high winds and with the whole summer season at risk we had no option but to get her hoisted out for a week thus blowing everything we'd saved by staying in the water over the winter. Paul under close supervision from Toby and Bru! Early May saw Rik and I on board but on dry land. We anti-fouled the hull, fitted the log impeller and ticked off a fair list of other jobs over four days despite Rik being a little under the weather. Unfortunately, it was mid-June before Jane and I could next head to the boat. After travelling down on the Friday, Saturday was a shopping trip for foul weather gear for Jane and a new VHF for the boat. Sunday was a day of pottering around doing odd jobs. Monday saw us back in the water at last and by Tuesday, after throwing a lot of money at the faulty depth sounder, we were back in commission. The depth sounder was annoying as it was only a year old but it was either spend the money to replace it today and be able to go sailing or send it away under warranty and scrap the rest of the week. We chose to spend the money! We spent Tuesday night at anchor in the Yokesfleet off the River Roach and then headed into Burnham Yacht Harbour on Wednesday. Thursday saw us back at Fambridge - last of the big adventurers or what?! No, unfortuntely poor weather was once again in the offing so we resigned ourselves to going back into maintenance mode. tide in but they did settle down later. Saturday was more of the same so we called it a day and headed home. The deliberately optimistic passage plan called for a flat out mad dash Northwards which might even have seen us reach the distant wild lands of Co. Durham and a visit to the town (now city) of my birth. Realistically, we hoped to reach as far North as Scarborough or failing that the North Norfolk coast. 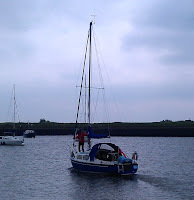 The plan to sail overnight from Lowestoft to Blakeney went awry in the wee small hours when the weather turned foul and we had to retrace our steps all the way back to Lowestoft. Technically we made it as far as North Norfolk I guess but we didn't set foot on it or even see much of it! The rest of the fortnight was spent gently idling our way back South including four days stuck in Southwold, having made a dicey entry into the harbour following a failed attempt to get back South (it was Southwold or back to Lowestoft again). It wasn't quite the epic adventure we planned but actually it turned out to be a really enjoyable trip! We visited Lowestoft, Southwold, the River Ore, Levington and Bradwell (including a walk up to St. Peters Chapel). We covered 323.1NM in 83:09 inclding 8:34 at night and 33:21 under motor. The beginning of September saw another family weekend of going nowhere and doing nothing much and then the weather put the mockers on our planned long weekend later that month.October saw Glen and I on board for a day of drifting and motoring and a day of fixing and fettling then a fortnight later Jane and I were down for a weekend visit to Burnham Yacht Harbour and a meal in the Swallowtail with friends from the East Coast Forum. To round off a busy month, the last weekend of October saw Tony and I making an overnight visit to lay her up for the winter after she'd been craned out into the yard the previous week. On the way home we dropped the engine in to Seamark Nunn for servicing and winter storage. All in all not a bad result given the mixed weather. Well almost. In fact 2012 wasn't quite done yet as the Bosun (Glen) and I made a brief visit at the back end of December to measure up for new sails. The weather being less than clement we didn't stop over and came back home the same day. The beginning of 2013 was expensive to put it mildly. After some over-winter debate about possiby changing to a bigger boat we'd decided to stick with Brigantia for several years (a decision that wouldn't last out the season) and so that led to the decision to buy new sails and various other items of equipment etc. The bill went well into four figures! Ho hum, early March saw all the boxes and bags loaded into two cars - there were too many to get into one - and the maintenance team of myself, Rik and Glen convening at Fambridge over the weekend. Despite poor weather, much progess was made before Glen departed homewards on the Sunday but Monday was a dead loss - at midday it was still well below freezing and conditions on board were horrible. We jumped ship a day early and gave up. What had originally been planned as a full week was now split into two with a visit to the Status Quo Frantic Four (the original 1970's lineup) reunion gig at Wolverhampton. 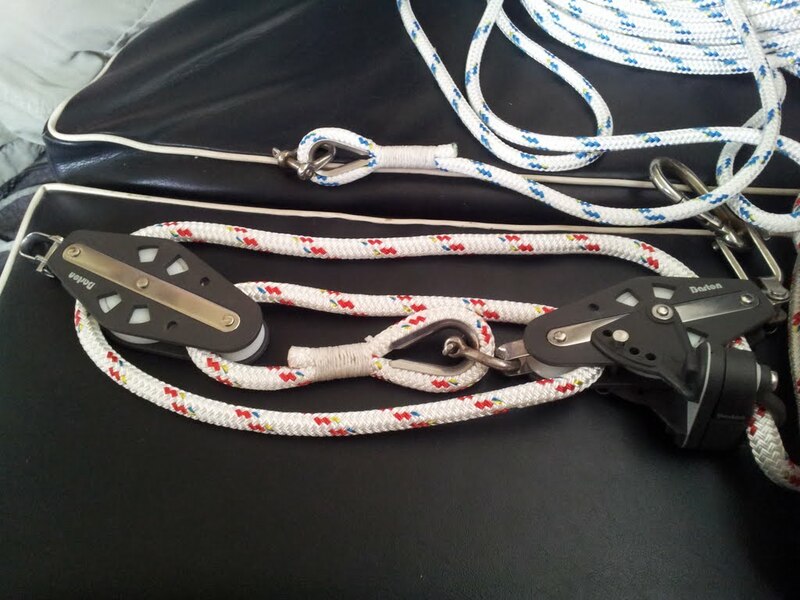 Mid-April and the Bosun and I spent a quick and dirty weekend in the yard slapping on a couple of coats of decent anti-foul. Enough of the cheap stuff that doesn't work, it was on with the Jotun Seaqueen which everyone who's in the know recommends. The back end of April saw Mark and I on board and Brigantia back in the water. The weekend went well with the new sails bent on and looking great and everything ready and ship shape for our third season of sailing. I wouldn't have admitted it at the time but quite a lot was riding on this trip. We'd failed to get anywhere as far afield as I'd wanted to in 2012 and the year had really been a bit of a washout. If 2013 went as badly it would raise questions about the future and given how much we'd spent fitting out for this season that was not to be contemplated! I needn't have worried! 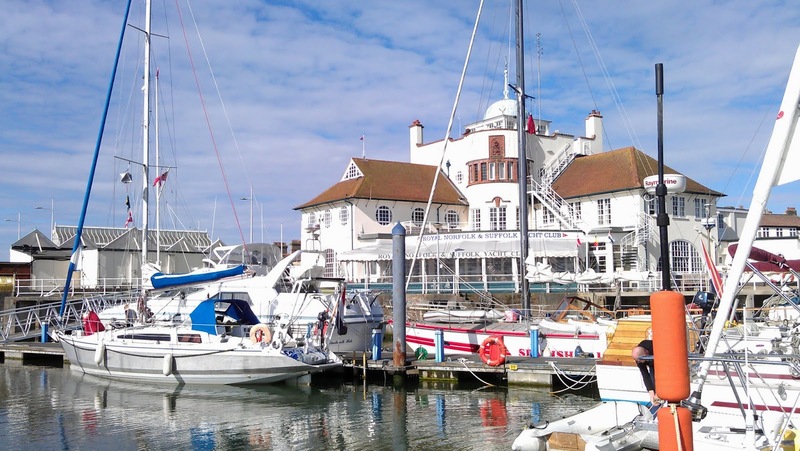 We had a storming sail along the South Coast reaching Hayling Island in just four days with stops at Ramsgate, Dover and Eastbourne. A couple of days in Chichester Marina and then it was a more gentle run back again adding Brighton to the ports list and a two day stopover in Dover. A bit less motoring would have been nice but the leg to and from Ramsgage to Fambridge accounted for a lot of that as we had to motor most of it both ways due to lack of wind. A fantastic, if somewhat tiring, trip. Tiring, I felt, because of the rather chilly weather and the lack of space on board when spending a lot of time at sea three up. Luckily, you see, I had a key to the cabin on my car keys as well but without the boat keys we could't unlock the padlock on the tender. A Sevylor inflatable canoe was duly procured, a bit expensive but all they had, and it did the job adequately. Then it was off round the corner to visit Tollesbury. We'd never been there and we'd long wanted to. In company part of the way with another forum boat Miracalee, we duly arrived and took up a berth in the marina. It's a nice spot with a nice club and a nice feel to it. Miraclee departed on the Sunday whilst we had a nice day in the sunshine and warmth, yes warmth, exploring the village and surrounding area on foot. Monday saw us beating back into the Crouch as is so often the case and encountering a vertiable fleet of Police boats! Back home on Tuesday morning after the best weekend we've had yet! Sailing was now interupted by our annual excursion to the IWA National Waterways Festival, this year in Watford, where for years now we've provided the PA, lighting and stage crew for the entertainment venues at the event. Our summer cruise in August started off a bit windy so Sunday saw us having reached the epic desintation of ... Burnham on Crouch (again!). For the first time though we had a good explore down into the town. Monday saw us stay put before a slightly bouncy run around to pay a second visit to Tollesbury on Tuesday. 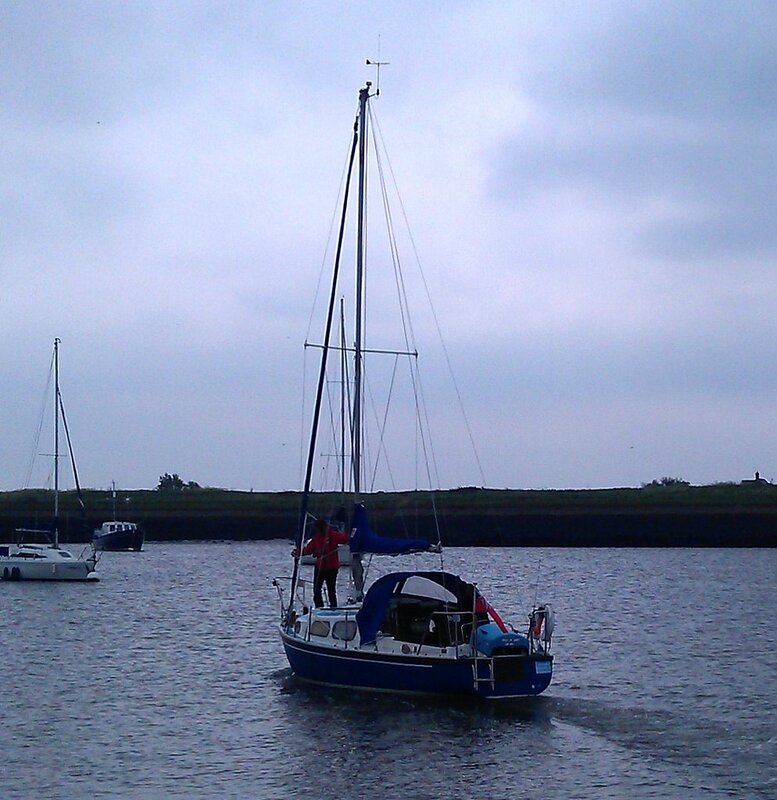 We wanted to go back as we had been considering a move to the moorings on Tollesbury Saltings. This would be slightly cheaper than our swinging mooring with the benefit of walk ashore access. However. the significant downside would be only being able to get on and off the moorings an hour or two either side of high water. Ultimately, we decided against it for now but who knows in the future? 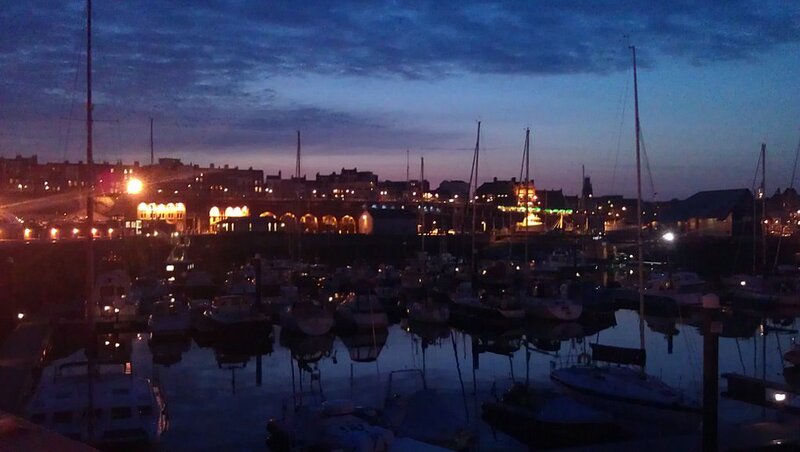 As we had planned for this trip, Wednesday was spent at our leisure in port. It would turn out to be a very expensive day! For want of something better to do, we decided to do some tyre kicking in the boat sales area and have a look at a couple of boats that might be of interest in the long term. We had no intention of buying any of them. Ahem! Thursday saw us heading up the Wallet to Shotley being chased by "Apogee" and beaten to the lock at Shotley by "Sirenia" (both ECF forum boats). After eating on board, all three crews repaired to the Shipwreck for beer and banter. After a day in port on Friday, a run up the Orwell on Saturday took us to Fox's marina where we had a look over our friend Lisa's new ship (it's too big to be a boat!) and a good meal followed by some singing of songs in the marina bar that evening. In amongst all this much discussion and thought had been going on about "Erbas", the Sabre 27 that Jane had fallen in love with and that I had to admit to quite liking too! By now we'd made up our minds to push the (ahem) boat out and try and buy her come what may. So given our schedule and the need to do a deal, Sunday saw a mad dash all the way back from the upper reaches of the Orwell at Ipswich to Fambridge. It started off with no wind at all and ended up with far too much of it and for only the second time on board Brigantia there was a period when I really wished I was somewhere else. Never mind, the job was done. After weeks of paperwork, organising surveys, sorting out insurance, kicking the bank up the bottom over delays on the loan and so on, finally in early September Jane and I drove down to Essex and after a night on board Brigantia drove up to Tollesbury to sign the paperwork and pick up the keys to Erbas. A visit to the now former owner Nic up in the village filled the boot of the car with lots of extra gear and bits belonging to the boat and then it was back to Fambridge and the pub! Two weeks later and Glen and I were at Tollesbury for a short weekend patching the antifoul where it had been scraped off for the survey, sorting out lockers and generally making sure everything was OK for the launch. The offer wasn't great but it was just enough and the deal was duly done. I guessed from the outset that the buyer was intending to make a profit by selling her on but that wasn't any concern of mine - some money in the bank and getting shot of what could rapidly become an expensive liability suited me just fine! At the begining of October, we moved Erbas from Tollesbury to Bradwell to escape the tidal clutches of Woodrolfe Creek and the following day Rik and I embarked on the final cruise of the good ship Brigantia taking her from Fambridge to Tollesbury to hand her over to her new owner. Well to be honest I can't be bothered to properly crunch the numbers! Over the three years we covered all told maybe 800 or 900 miles or so and spent the equivalent of nearly five months on board (or at least I did, Jane rather less). I might get around to working out more detailed stats at some point but don't hold your breath! We spent too much money on Brigantia, especially at the beginning of 2013 but overall the costs spread over three years have not been ridiculous. Had we spent the roughly £3k a year on luxury package holidays abroad nobody would have batted an eyelid. This 'blog' started out as a (private) means of keeping a record of our activties on Brigantia which would be accessible to the crew, our families and a few very close friends. It soon dawned on us that the circle of friends, many of them from our canal boating days, interested in keeping up with our shennanigans was a lot wider than we thought and that there was a potential general interest readership. So the existing blog, after some editing, was made public (and a new private crew blog created for those odd items of discussion and record that it would be unwise to put in a public place). We hope you enjoy it! It is still, however, written primarily for our own benefit and we feel no compulsion to post every day nor to make a particular effort to appeal to a public readership. Some posts may be chatty and amusing, others will be dry log entries for the record. There will be periods of no activity on Brigantia due to work commitments when nothing will happen for two or three weeks at a time. That's the way it is. As of January 2013, all advertising has been removed from the blog. If any adverts appear, they aren't down to us! There is ALWAYS someone in residence at our home address - there are four adults living in our house and at least one is always at home at all times. Our neighbours are also VERY alert to any suspicious activity. Briganta is moored within yards of the floating homes of two members of staff at the marina who know all of the regular crew by sight. They will notice any unusual activity for sure.